What can I do with my family today? Well, if you are in New York or New Jersey then there are lots of things you can do! NJ might be one of the smallest states in the US but it isn’t short of fun. In fact, it is beaming with marvelous attraction spots that you can always explore anytime. Let’s look at some of those that stand a cut above the rest, including some free ones of course! Enjoy a view from Brooklyn Bridge Park coupled with fun activities tailored to adults and kids. There is a basketball court if you are into sports while kids can get to enjoy an antique ride, incredible slides, jungle gyms and much more! Enjoy time one of the hundreds of beaches in New Jersey. NJ is known for having beautiful beaches but unfortunately, some of them can be rather expensive. That said, there are free public beaches that are still top notch for families. This includes the likes of Sandy Hook Beach, Keansburg Beach, Ideal Beach, The Wildwoods Beach, Atlantic City Beach, Cape May, Somers Point Beach, Strathmere etc. 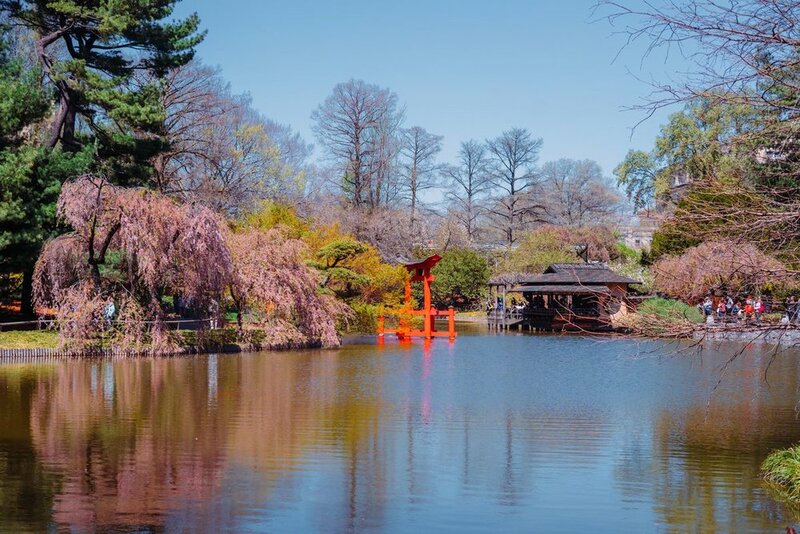 Explore the Brooklyn Botanic Garden, an attraction site made of plants only. Sounds boring? Well, this is not just any plant garden. It is one packaged for fun and it should be exciting for your kids. You and your kids will not only learn about thousands of plants from around the world but there is still some room for play as well. For example, there is a Children's Discovery Garden made of a nature path and play zones to spice up the experience for kids. Visit the Cape May County Zoo, a kid friendly attraction site with hundreds of animal species including tigers, bears lions among others. There are also tons of outdoor activities you can enjoy such as hiking, biking trails, a disc golf course, volleyball, tennis etc. Go for a tour in one of the family friendly museums in New Jersey and get trip down history or get a taste of art and science. Some of the best museums in NJ that you can visit include the likes of Franklin Mineral Museum, Grammy Museum Experience, Heritage Glass Museum, Imagine That, Matchbox Road Museum, Ground For Sculpture, Monmouth Museum, Morris Museum, Newark Museum, New Jersey State Museum, Sterling Hill Mining Museum, Stone Museum, Yogi Berra Museum & Learning Center, Liberty Science Center etc. Take a family trip to the border of Pennsylvania and New Jersey where you can explore the scenic Delaware Water Gap National Recreation Area. Your family will love the nature trail that blends in well with beautiful mountains, not to mention the plethora of activities you can do there especially if you are adventurists. We are talking about activities like swimming, fishing, canoeing, hiking, rock climbing, rafting, mountain biking and more. Visit the Adventure Aquarium located on the Delaware River. Here you will be educated about some of the finest marine life including hippos! Yes, it is the only aquarium in the world featuring hippos but this is just a highlight. You will get up close to thousands of other aquatic species in their natural habitat. You can take a ride on the Staten Island Ferry and get a superb view of New York City and the Statue of Liberty. Explore the genius of Thomas Edison by touring the Thomas Edison National Historical Park. It is the preserved home and lab of one of the world’s greatest inventor. If you don’t know who he is then he is the engineer behind the electric bulb and many other innovations in the world of electrical engineering. You will definitely get to know more about his work and others in this historic park. These are just but a few activities you can enjoy with family or even friends in New York and NJ. Let’s just say, you will never run of things to do in NJ and the beauty is that you don’t have to spend a lot of cash to have fun with your loved ones!